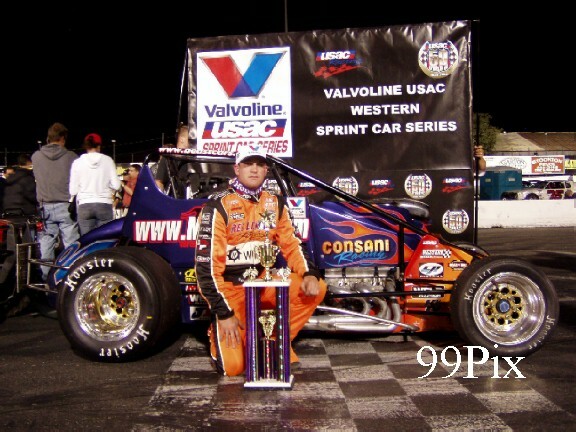 By Bobby Gerould (June 25, 2005 -Stockton, CA) Brian McClish, #04, from Santa Rosa, CA took home the $2,500 winners share after 50 laps of USAC Western Sprint Car racing at Stockton 99 Speedway Saturday night. McClish set quick time in his family owned #04 and started sixth in the feature event on the ¼-mile high-banked paved oval. Mike Murgoitio shared the front row for the main-event with Tim Barber. 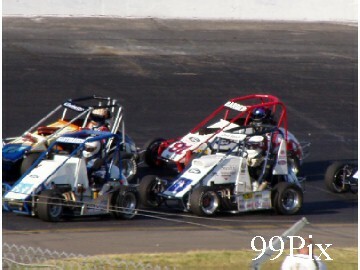 As the two led a 17 car field to the green flag, their cars touched, and Barber smacked the front chute wall, setting off an accordion effect on the cars behind them. 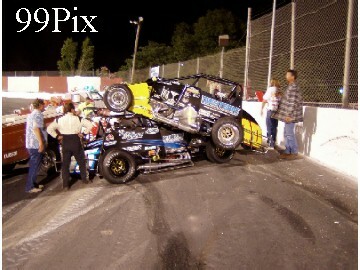 Drivers hit the binders and a chaotic mess ensued in turn one. 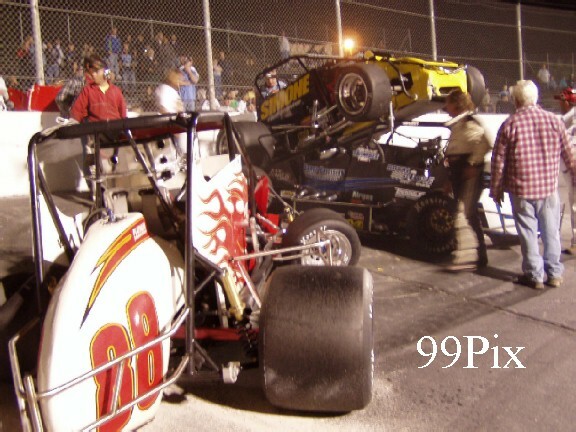 Brad Bumgarner, Michael Trimble, and Anthony Simone all crashed together with Bumgarner, #88, getting the worst of it. The Chico driver was hit from behind and then hopped a wheel. 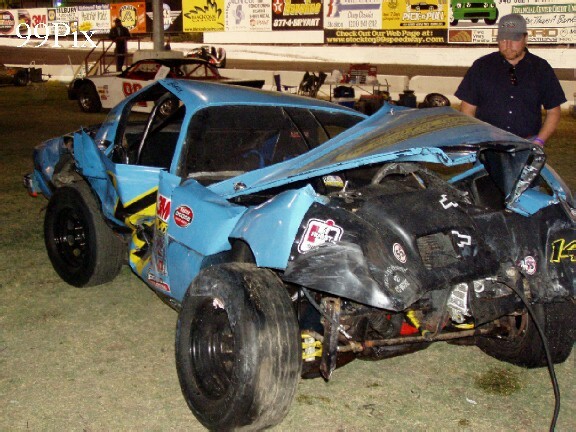 Once airborne he slammed into the turn one retaining wall, destroying his #88. The car fell onto its side in a tangle with the #15 (Trimble), and #10 (Simone). None of the drivers were injured other than Bumgarner who was walking with a limp. He shrugged it off saying, Im okay. I just hope we can get a car ready somehow for Shasta. The Shasta race is the next on the USAC Western Sprint schedule. 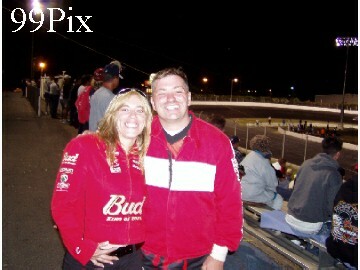 It is earmarked for July 9th at Shasta Raceway Park in Anderson, CA. The race restarted with Murgoitio sharing the front row with Nick Rescino Jr. Tim Barber was relegated to the rear of the field for work done on his car during the red flag. The work was necessary for Barber to continue after the wheel-banging on the initial start. Rescino, #11, got the jump and immediately opened a sizeable lead. Destiney Hays went low in turn four on lap two to take second spot from Murgoitio. McClish meanwhile was moving forward. He dropped Hays to third with an overpowering run down the back straightaway on lap six. As Rescino and McClish held the two top spots, a battle royale was taking place for third between Hays, Kody Swanson, and #94, Tony Hunt. Swansons #75 contacted the rear of Hays #28 as the two drove past the start-finish line to complete lap 12. 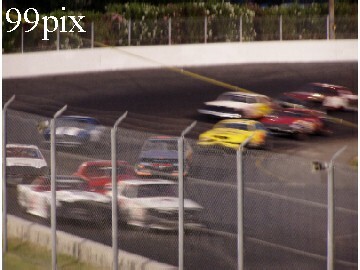 The contact sent Hays sideways and into the wall just shy of turn one, bringing out the first caution flag of the event. 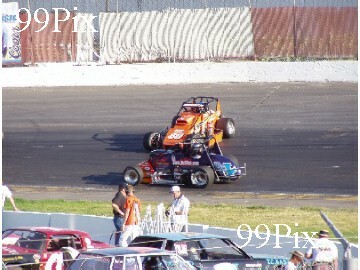 By lap 21 Rescino appeared to be losing traction as he had repeated loose moments in turn four. McClish closed quickly and was on Rescinos rear nerf looking for a way around. Swanson and Hunt caught the top two and suddenly a four car race for the lead was pleasing the fans. 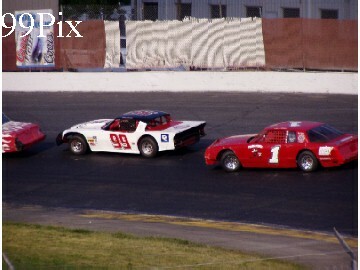 As Swanson ventured to the high groove to try to pass McClish, he opened the door for Hunt who gained third on lap 24. In his haste to gain back the spot lost, Swanson spun in turn one on the next lap. 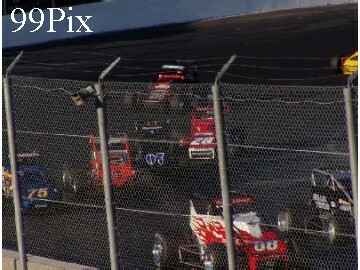 With 26 laps remaining, Rescino restarted as the leader with McClish, Hunt, Barber, and Scott Hansen right behind him. Shauna Hogg dropped from the race with a mechanical failure on lap 24. The lead changed hands on lap 26. McClish blew by Rescino on the front chute, and on the next lap Hunt did the same. The remainder of the race was a battle of Hunt trying to reel in McClish. On lap 45, the pair now running nose-to-tail, hit traffic. 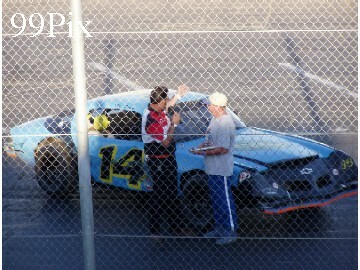 McClish darted while Hunt diced and at the checkered flag McClish withheld Hunt by a car-length. 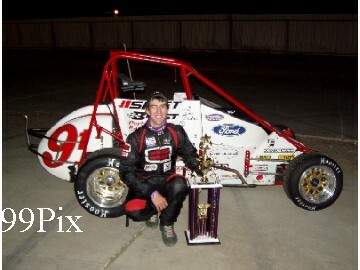 The win was the second career USAC sanctioned triumph for McClish. I want to thank all of my sponsors, and my family. said the happy winner. I respect Hunt and Rescino, and they raced me clean. Thats all you can ask for. Barber rebounded fantastically from the opening lap incident to finish fourth. Hansen was fifth followed by Murgoitio, Veenstra, Chris Petersen, Audra Sasselli, and Peter Gobel. 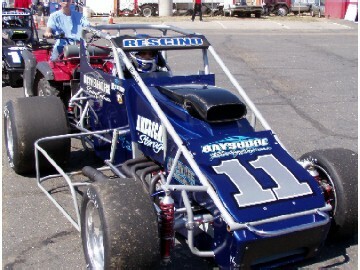 Sasselli was making her sprint car driving debut in one of two Ted Finkenbinder entries. 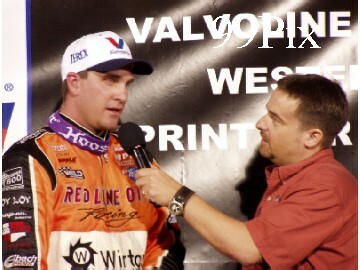 Gobel earned the Weld Racing Hard Charger Award for starting 17th and ending up tenth. A-Main finish. 50 laps. 1. Brian McClish, 2. Tony Hunt, 3. Nick Rescino Jr., 4. Tim Barber, 5. Scott Hansen, 6. Mike Murgoitio, 7. Cody Veenstra, 8. Chris Petersen, 9. Audra Sasselli, 10. Peter Gobel, 11. Destiney Hays, 12. Kody Swanson, 13. Shauna Hogg, 14. Rick Hendrix, 15. Michael Trimble, 16. Brad Bumgarner, 17. Anthony Simone. 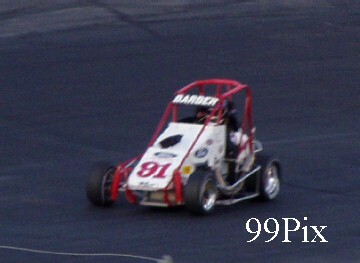 Chase Barber, #91, of Morgan Hill, Calif. captured Saturday night’s 50-lap USAC California Pavement Ford Focus Midget race, leading 33 of the 50 laps at the 1/4-mile paved Stockton 99 Speedway oval. 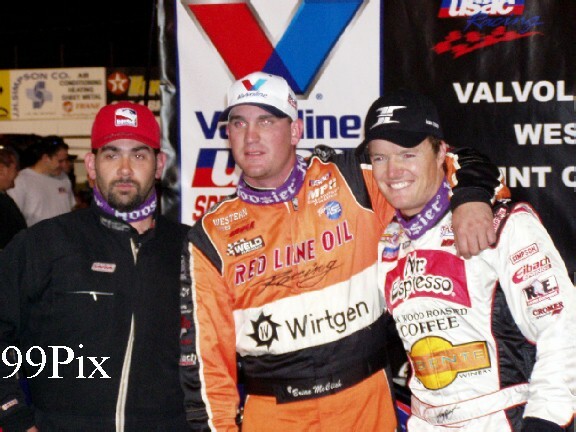 The teenager jumped to second in series standings behind new leader Alex Harris after winning Saturday’s 50-lapper at Stockton (Calif.) 99 Speedway after a fierce battle with Harris and Robbie Whitchurch, (left). Barber led twice for 33 laps, leading the opening half and the final eight circuits. 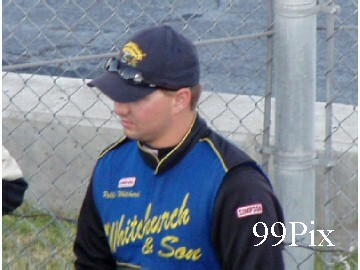 Harris also led twice for 14 laps, while Whitchurch took the point for three laps. Barber, driving the No. 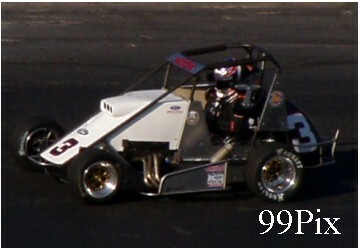 91 Beast/Ford Focus, led fast qualifier, #3, Benny Moon, Harris, Jace Meier and Jeff Sakowicz. Audra Sasselli, #17, (right), who led the points going into Saturday’s event, finished ninth. 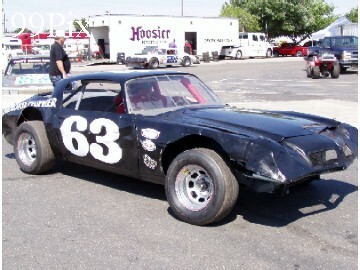 Harris, who has four victories on the hardtop this season, looks for number five this weekend at Irwindale, where he has won all three series events at the 1/3-mile track this year. His series total sits at 12 points over Barber. STOCKTON, SATURDAY, JUNE 25 --In CL BRYANT American Limited Stock Car NASCAR racing fans were treated to a 30-lap main event, a dash, door-2-door, two 8-lap, 10-car heats and qualifying runs. In the main Stockton's #75, Chad Holman opened the evening with the fast qualifying time, then started the 20-car, 30-lap main event at pole position. 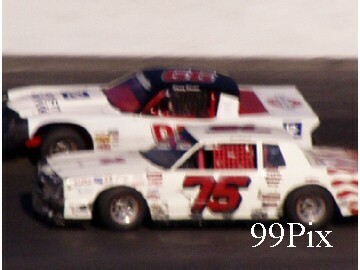 Holman held onto first through lap-8, until he and Stockton's Donny Darter were paired side-by-side on a restart, by lap- 10 Darter took the lead and held it through to the end of the race. 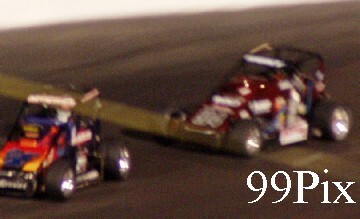 The battle for second and third place wasn't decided until lap-20, when Stockton's, #1, Joe Allen made a move on Holman and advanced up to behind #99, Darter, who then held second to the finish. Holman came in third, Escalon's Darrell Hughes ended fourth and Stockton's Richard Harper rounded out the top five. So far this season Stockton 99 Speedway fans have got to witness a mother and son and father and daughter race on the same night, but last night was the first time that they got to see a father and daughter team compete in the same race! 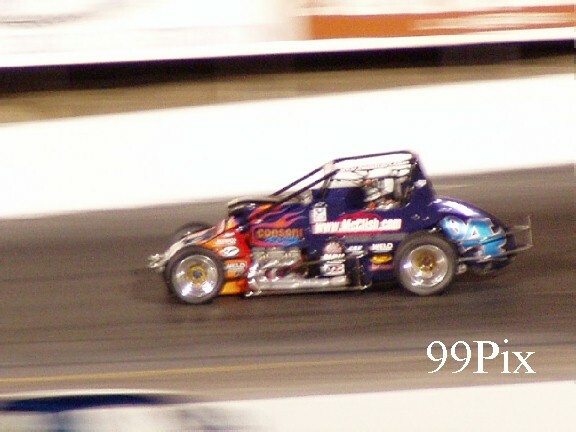 All season long Stockton's #63, Leroy Hunt has been running in the ALSC main events and daughter Samantha Haeseker, of Manteca, has been beating the pavement in the B-mains, this was the first time that both competed in the main. 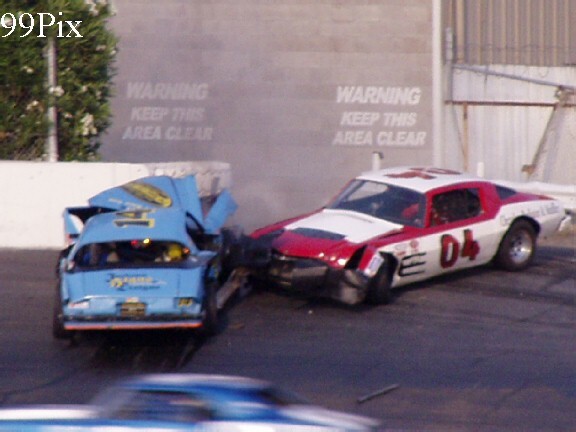 Note: After winning the door-to-door dash in the ALSC division, #14 Steve Brown of Lake Comanche suffered a setback when he and #04 Tom Dahl of Lodi crashed and severely smacked the wall to the exit gate in turn 3. Luckily, nobody was injured. On Saturday, July 2 Stockton 99 Speedway will play host to the second leg of the HAVOLINE Western Late Model Tri-Holiday Classic 100-lap race, the 100-lap CALIFORNIA WELDING SUPPLY SRL Wildwest Shootout, CL BRYANT American Limited Stock Cars and Pro-4 Trucks. The four division night will give NASCAR DODGE Weekly Series race fans more than 250 laps of quarter-mile, paved oval action! Race fans will also be treated to a July 4 Fireworks display and a “Salute to the Memory of JD Moore.” JD is the late son of WLM driver John Moore of Granite Bay. He was tragically killed in a track accident in October 2004. The salute will be a memorable event that will celebrate the racing spirit that lived in JD.